This summer has produced some prolific blooms on our hydrangeas! The full round blooms of the Annabelle Hydrangea are the size of softballs. 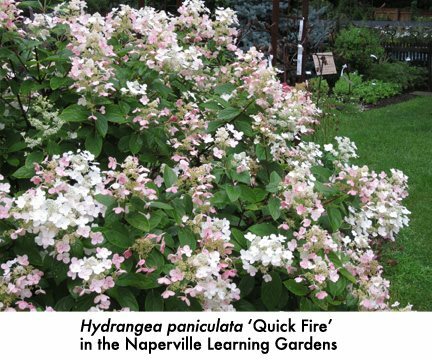 The pinkish color and striking blooms shooting from the great foliage of the Quick Fire Hydrangea, have people stopping as they passed it in our gardens. Speaking of great foliage, Oakleaf Hydrangeas, are lush this year and will be just fantastic this fall, ablaze with a burgundy red color. The brilliant green glossy foliage on the Climbing Hydrangea is only surpassed by the fragrant flower clusters it produced. Which Hydrangea Should You Plant? With so many new introductions and varieties, picking the right Hydrangea for the right spot can be confusing. Hydrangeas provide big, bold blooms at a time when few shrubs are flowering. As flowers start to turn papery, they can be cut for drying, or left on the plants to add excellent interest in the winter. All varieties have one thing in common—they love to be planted in well-drained soil. Hydrangea arborescens, ‘Annabelle’ and ‘Incrediball’, are the first to bloom in early summer with blooms if left to dry on the stems that can last through winter. Their big blooms that start out green turn white and then return to green which tells you it’s the perfect time for cutting and drying. Though they are shade loving, they can also tolerate some sun with adequate water. Hydrangea paniculata, are the most adaptable of hydrangeas with cultivars that can be grown in full sun to partial shade. It offers panicle-shaped sterile and fertile flowers that can be chartreuse, white, and shades of pink. Excellent fall color ranges from yellow to orange. Many new introductions make this a useful and easy-care plant for all styles of gardens. ‘Limelight’, ‘Pink Diamond’ and ‘Quick Fire’ are the largest growing 6-8 feet high and wide, with some available in tree form. ‘Tickled Pink’, ‘Little Lime’, ‘Little Quick Fire’, ‘Mystical Flame’ and ‘Bobo’ are smaller varieties that range in size from 3-6 feet high and wide. Hydrangea macrophylla are known for their great foliage and flowers that can be white or shades of pink, lavender and even blue with the right soil composition. Our soil pH is alkaline which produces a pink flower. A more acidic soil produces a blue flower. To change the flower color, we recommend amending your soil with Espoma® Soil Acidifier. ‘Bloomstruck’, a new addition to the Endless Summer collection, features a stronger, striking red-purple stems and 3.5-5 inch rounded flowers that can be bright pink flowers and with the right soil ph can be violet or blue. Hydrangea quercifolia, commonly known as Oakleaf Hydrangea, have spectacular fall color. Its exfoliating bark and dried brown flower heads add great winter interest. These Hydrangea can grow in full sun to full shade. The flowers start blooming white early to mid-summer then change to a pinkish mauve color and, finally, dry to a brown hue. The leaves turn spectacular shades of red and burgundy in the fall. ‘Alice’ grows 4-6 feet wide and tall with large oak-shaped leaves and large flower panicles that age to pink-rose. ‘Pee Wee’ has similar characteristics but is a more compact specimen for smaller gardens. The best kept Hydrangea secret is the beautiful vine Hydrangea anomala petiolaris, more commonly know as Climbing Hydrangea. This is the very best vine for shade! If you’re looking for a vine to grow up a study trellis to screen off an area this is your best bet. It is a wonderful vine to grow up around a tree. It’s green glossy foliage, fragrant flowers that bloom 6-10 inches and peeling bark adding great winter interest are just 3 good reasons to plant this in your yard. Better yet, Climbing Hydrangeas are drought tolerant, rabbit resistant and attract butterflies.